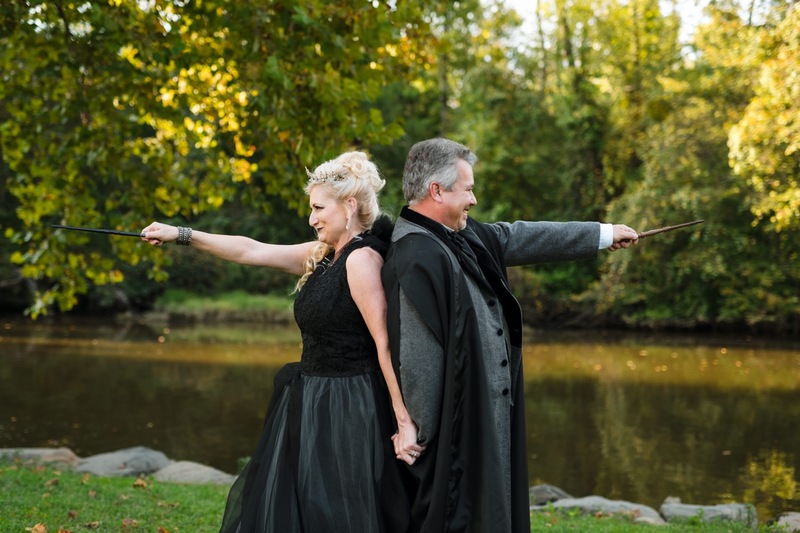 Maryland wedding season 2018 has been a wonderful one, and this magical Harry Potter themed wedding on the Eastern Shore was an extra special treat. As a voracious sci-fi and fantasy reader from a young age, I discovered J.K. Rowling’s wonderful world early and devoured each book within days of its release. The movies are still some of my favorites, and I do a full marathon watching of them at least once a year. Have you played the Hogwarts Battle game? It’s amazing. Suffice it to say, my Harry Potter nerdery runs deep, so I was beyond thrilled to hear Kim and Ted’s plans for their fantastic wedding day. These two went above and beyond though. From the cake (with an amazing dragon on it!!) to the table of Honeydukes’ sweets to their own wands to delightful guests in their own fantastic costumes and cosplay. But enough yammering from me–the photos are what you want to see, so here they are!